FIRST FAMILY introduces young readers to the American president's family at home, at work and at play in the White House. Presented mostly through the eyes of daughters Malia and Sasha, FIRST FAMILY describes the similarities in the everyday life of the First Family and other American families. FIRST FAMILY also shows how Malia and Sasha's life differs from other children, helping young readers to imagine how their lives might change were they to be children of the American president. 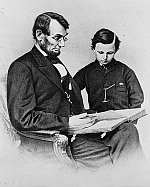 Deborah Hopkinson's FIRST FAMILY focuses on themes of family, the White House and the continuity of American history. For the first time in many years, young children are residents of the White House and what better way to introduce children to the notion of the Presidency, the White House and American history than through the eyes of the children who live there! With words and images, Deborah Hopkinson and Ag Ford emphasize the role of family. Despite their new home, Malia and Sasha are children with lives grounded in the family. Values of healthy eating, exercise, doing homework and cleaning one's room emerge from the picture painted of the First Family's life together but not to the exclusion of playful fun and family togetherness. FIRST FAMILY presents a wholesome, positive role model of the family for children readers. The beauty and uniqueness of FIRST FAMILY as a young children's book centers around the portrayal of the White House, a living museum which houses items that connect each generation of Americans. With images and words, American history comes alive. 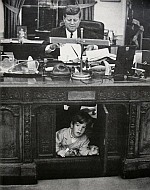 The description and illustration of the Resolute Desk, a desk also used by Presidents Kennedy, Clinton and Bush gives young readers (and adults reading aloud to children) a moving look at the importance of the history of this country. Not only is America a country with a rich historical legacy but also a nation with a sense of continuity between past and present. Illustrations of the White House portray the grandeur of the building itself and the impresive furniture inside. Two pages of White House and First Family Trivia, facts and fun conclude this inspiring book thus once again connecting past and present. FIRST FAMILY does an excellent job at humanizing the family while also honoring the rich legacy of American history.